Above you can see one of my favorite meals, one that is not German. Of course, some of my favorite meals are German, others Italian and I also like Asian food but the meal in the picture is Arabic or North African. It’s called Couscous or Cous Cous and it’s hot, and super delicious. My mother can cook it very well, but she did not learn it with a cook book. Before her current husband, she was together with someone else, and his sister was together with someone who came originally from Tunisia. We were regularly invited and they prepared Arabic food and everything was delicious. But I started to love Couscous right after I put the first spoon in my mouth. It’s super spicy, when you are new to it, it burns your mouth because of the chilli peppers and lots of Harissa. But for me it worked not just because I like spicy things, it worked also because I think we Germans love a bountiful table and heavy food. Couscous is basically the orange grain, but it gets the color because it is put into a steamer on top of a pot where you have the sauce and all the ingredients boiling. Since the steamer has holes and sits on top of the pot, the Couscous will absorb both, the flavour and the color. Lots of other things are needed like the mentioned Harissa, tomato paste, goulash, potatoes, very hot chilli peppers, chick peas, green peas, eggplants and zucchini. You see, the shopping list is long when my mother prepares it, and it’s not uncommon that we have to run two times because we forgot something. I always help her when she prepares it, but I wouldn’t say that I could do it alone, but together I know how I can be a help. It’s a time-consuming preparation, the shopping alone is time-consuming but it rewards you with one of the most delicious meals that you can find on this planet. Yes, I am not kidding, it’s one of the best meals. I grew up with someone from Eritrea, and they partly ate spicy things too but when my mother invited him, his mother and his half-father, they all said it was extremely spicy. But at least they knew what to do. My Turkish friend knew it too. But it was always funny when we invited my German friends to try out Couscous, they got tears in the eyes while eating and they made it worse by drinking water or soft drinks. Nope, that’s not how it works, it just makes it worse (laugh). Capsaicin doesn’t dissolve in water, all you will do by drinking water or soft drinks is making the spicy feeling spread everywhere in your mouth. We did let them make the mistake, it was always funny. If you’re not used to it, the trick is to drink milk because the molecules of it it will dissolve the capsaicin, it’s like washing it out of your mouth. Another personal tricks is, but I can’t explain why that works, is to eat the potatoes that are served with the Couscous. So, after a short laugh, we always pointed at the milk on the table and suggested to drink it and eat a potatoe. This is how they got a normal looking face again, haha. Of course there are people who are generally not fans of too spicy things, and they never asked us to prepare it again. But there have been quite a few people who begged for a second invitation where we prepared it again. 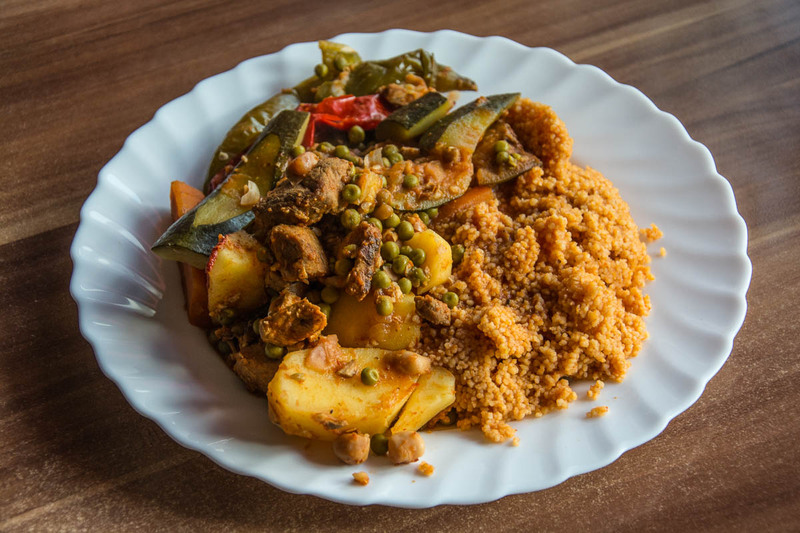 We ate this with the family of a friend at least once a month, because they became great fans of Couscous. So, unless you dislike spicy food, when you make it through your first plate, you will want to eat it again. Also it must be noted that the bite doesn’t come from the spicy Harissa alone, it’s also about the type of chilli you choose. It’s basically a combination of both, plus the amount you use. But we had it happen that we got very mild chilli, and that the meal turned out less spicy. Even then it tastes great, but I love it when it makes you sweat, although you get used to it with time. It also happened that I told my mother after testing a spoon “I think this time we can’t shock someone with it”, but the guests got tears in the eyes and a red face. You get used to it, when you eat it once in a while. No matter if it turns out really spicy, or more mild, it’s always delicious. If you get a chance to try out a Couscous meal, do it! It’s really that, extremely delicious and something you should have tried. I love couscous, but Garry is not a fan. A real pity. It’s one of my favorite dishes.